There are multiple reasons political discourse is degraded by the fact that it now plays out primarily on Twitter, reasons that are inherent in that site’s format and functionality: the elimination of nuance due to space constraints; mob behavior coercing adherence to group-think orthodoxies; the addict-like, insatiable craving for re-tweets and likes which the brain processes as approval and for which it thus produces chemical rewards of ecstasy and a sense of worth; and highly tribalized fiefdoms where it’s remarkably easy to create self-affirming bubbles in which one only hears from from those who affirm, cheer and validate, rather than challenge and dispute, what one believes and what one wishes to believe is true. (I say this not as some above-it-all sociologist magically immune to those dynamics but as someone who uses Twitter as a necessary part of my work and am thus viscerally aware of the lure of those temptations and the challenge to consciously resist them). But perhaps the most the discourse-degrading feature of Twitter is how it makes deliberate distortions uniquely easy and effective, by enabling the tearing of statements (single tweets) out of their context and, months or years later, imbuing them with a meaning they never had. I am unable to count how many times this has been done to me over the last two years but I’m by no means unique: it’s not an exaggeration to say that – because of the ease with which this is done on Twitter specifically – this has become one of the most preferred means for partisan operatives and pundits to smear others in the never-ending political wars that play out on social media. I’m going to briefly highlight one that happened last night in part because it comes from a former Obama Pentagon official and current NYU Law Professor, Ryan Goodman, and thus was imbued in the minds of some with the stamp of some sort of authority, but also because it’s such a vivid illustration of this type of distortion, since anyone who has ever heard or read a word I’ve ever uttered (let alone someone such as Goodman who has read my work regularly over the years) will instantly see that the view he attributed to me with an out-of-context tweet is something I have never believed and would never suggest (I realize some are tempted to dismiss all of these sorts of discussions as “trivial Twitter beefs” but “Twitter” is nothing more than the venue in which so much influential political discourse is now conducted; thus, there’s nothing trivial about the systematic abuse of it for dissemination of propaganda and systematic distortions). Goodman’s point here is a simple one and – based on the snippets of information he chose to provide – appears at first glance to be valid, like he caught me in some sort of contradiction. He’s implying that back in July of last year, I told MSNBC’s Chris Hayes that, at some point, Robert Mueller is going to tell us all what happened and that we should wait for him to do so before deciding what we believe, but now that Mueller has told us what happened (in the form of the indictment filed on Friday), I’ve now radically changed my view by arguing that indictments are merely prosecutorial assertions presented without evidence and not something we should blindly assume true. (Just in case someone did not understand Goodman’s accusation on their own, he added a helpful hashtag to encourage them to believe I’ve changed my view: “#MovingTheGoalposts”). 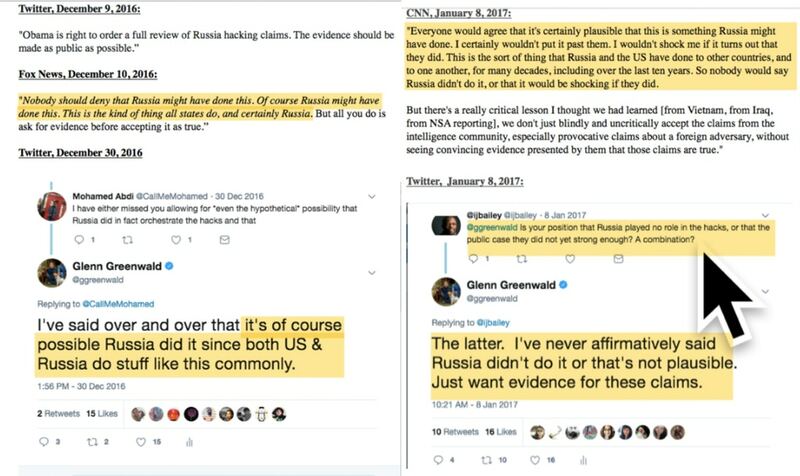 Indeed, if you look just at the 24-word tweet-reply of mine from last year that he tore out of its context (which was a long discussion about the validity of “collusion” claims), and then set that single 2017 tweet next to the other short tweet-reply from this week that he also tore out of its context (a long discussion of Mueller’s indictment), they do indeed appear contradictory. With this tactic, Goodman successfully created the appearance that, last year, I was arguing that we should place blind faith in the pronouncements of Mueller, but now I’ve changed my mind and instead am arguing that Mueller’s claims should be subjected to skepticism and that evidence should be seen before believing them. But for anyone with the most minimal familiarity with my views as expressed over the last 13 years in journalism and politics – to say nothing of the decade before that practicing law – Goodman’s deceit here is self-evident, requiring no work to explain. Of course I am not someone who ever believed that we should blindly believe a prosecutor‘s assertions on faith, without seeing evidence. Of course I am not someone who ever advocated that we should treat as Gospel whatever claims George W. Bush’s former FBI Director, Robert Mueller, asserts about this matter without being able to evaluate the evidence for ourselves. In Bob Mueller we trust. George W. Bush's 9/11 FBI Director is both infallible and above reproach. Once he indicts someone, I don't even think we need a trial – let's just skip to the punishment part. In sum, the view Goodman attributed to me to make his point is literally the exact opposite of the view I’ve spent years vehemently advocating. But realizing this takes a brief moment of reflection, along with a desire to understand the truth. And Goodman – like all of those who exploit the design of Twitter for this tactic – knows that so many users don’t spend time critically analyzing what they’re told by political allies about political enemies, and have as their main goal political warfare rather than truth-seeking. For that reason, Goodman – who has become one of the online leaders of the Trump/Russia fixation – knew he could get some fleeting social media rewards (re-tweets, applause, gratifying chemical brain reactions from crowd approval) by making me look like I contradicted myself, all by attributing to me a claim that I very obviously have never believed and never suggested and is indeed the exact opposite of my anchor beliefs about the world. What I obviously meant by the tweet to Hayes that Goodman tore out of context is the same incredibly simple point I’ve been advocating for two years about this topic: that our beliefs about what happened should be shaped by a rational assessment of evidence we can evaluate rather than blind, faith-based trust in the assertions from anonymous CIA officials, security state agencies, and prosecutors. When I told Hayes that it was a good thing that there was now a credible prosecutor with subpoena power, I obviously did not mean that once that prosecutor issues an indictment unaccompanied by evidence that we should all treat it as pronouncements from a deity. What I meant instead, obviously, is that this investigative process will ultimately enable all of us – as journalists, as citizens – to finally see the evidence and make rational judgments about what happened here because, at some point, the process will require that this evidence be disclosed. My demand this week that a prosecutor’s indictment not be treated as proof – a proposition that, before Trump/Russia mania, was too self-evident to need expressing, especially among lawyers – was so obviously not a contradiction of what I said in 2017, or at any other point in my life, but an affirmation of what I’ve always said and believed. It was an expression of what I’ve been saying over and over since the entire Trump/Russia controversy emerged: that we should only believe claims when there is credible evidence available to assess. Because Mueller’s indictment – like all indictments – contain only assertions – not evidence for those assertions. That includes critical assertions such as GRU operatives were responsible for the DNC and Podesta hacking; Mueller has asserted this in the indictment, but presented no evidence for those assertions. No rational person should assume their truth. In fact, I’m truly ashamed to see journalists, including ones I respect and have worked with, treat Mueller’s indictment as proof, just as I’ve been ashamed by journalistic peers who have treated CIA and DHS assertions as Gospel. Whatever dangers one thinks the Kremlin poses, there are grave dangers from having journalists (of all people) treat the claims of CIA officials and prosecutors are gospel without being able to see the evidence on which that evidence is based. Goodman’s attempt to suggest that I once advocated that we should place blind faith in Mueller’s assertions is utterly self-evidently false, but it’s central to his little tweet game. The problem – one faced by all who are targeted with these kinds of distortion campaigns – is that in order for me to debunk Goodman’s purposeful distortion, I just had to write multiple complex paragraphs that take work to read and process. By contrast, it took Goodman roughly 20 seconds to concoct and disseminate his deceitful summary into a single tweet that is remarkably quick to digest and even quicker and easier to spread with the click of finger. 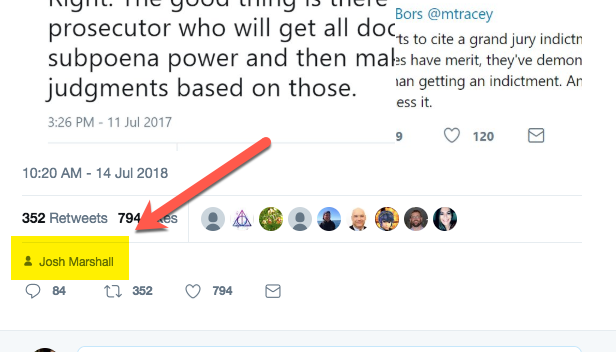 That’s what Twitter incentivizes and why it’s so toxic: Goodman knows that he can derive instant social media benefits by appearing to vilify someone regarded as a villain by Democratic Party loyalists, and securing those benefits – rather than making any sort of accurate point about inconsistency – is his goal. One of the many ways to know this is what motivated Goodman – and this is really quite sad – is that he employed a somewhat obscure feature on Twitter that allows a user to alert other users with bigger platforms of one of their tweets in the hope of getting greater exposure for them. And, needless to say, and just as Goodman hoped, some of the Democratic partisans with the largest platforms instantly re-tweeted his distortion about me and my statements, meaning that tens of thousands of people if not more have seen the tweet and – just as Goodman intended – were misled into believing that, last year, I wanted Mueller’s claims to be uncritically accepted as truth but now I’ve changed my mind (#MovingTheGoalposts). Over the past two years, I’ve discussed my views of Trump/Russia in dozens, if not hundreds, of lengthy interviews, TV appearances, speeches, podcasts, and articles. If someone like Goodman were genuinely interested in accurately engaging what I have argued and believe, they would use those more substantive, contextual discussions. By contrast, someone who was interested in securing cheap online applause and smearing people would use a single out-of-context tweet and then purposely attribute to it a belief that I obviously do not hold. That’s one way to know when someone is trying to use Twitter to deceive and smear rather than discuss and inform. Replies to Goodman’s tweet were predictably filled with claims that I’m a paid Kremlin agent and proto-Trump supporter: the type of following this mentality cultivates. One can’t prevent this sort of deceit, but one can, and should, periodically highlight how it functions and take steps to prevent its efficacy. While we’re at it: here are the statements I made about Trump throughout 2015 and 2016 that disprove the widely circulated accusation that I supported his candidacy. Here are the statements I made about Trump throughout 2016 that give the lie to the claim that I depicted him as a “peace candidate.” Here are the articles I’ve written in 2017 and 2018 that negate the widely circulated claims that I don’t report critically on the Trump administration. That’s a long record of in-context, developed, substantive statements and articles that express the views I actually hold and have advocated. There is plenty in what I do, say and believe that can be subject to reasonable critique and dispute. That’s why those, like Goodman, who try to attribute to me things I so plainly do not believe – indeed, that are so contrary to my core beliefs about the world – are so transparent in their motives. But Twitter has provided a venue that is uniquely designed to disseminate falsehoods of this sort and to shield them from meaningful refutation, which is why he and those like him use it for that, and why tiresome refutations like this one become necessary.